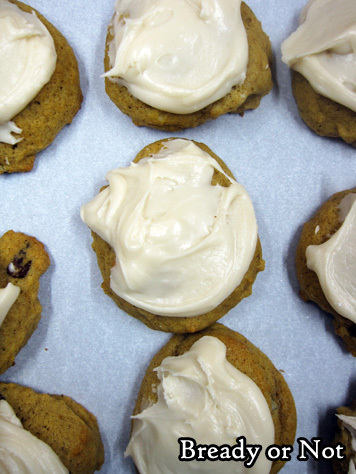 October is here, and that means pumpkin recipes! 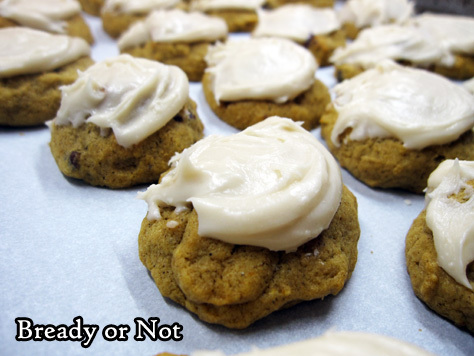 Let’s kick things off right with Pumpkin Cookies with Penuche Frosting! 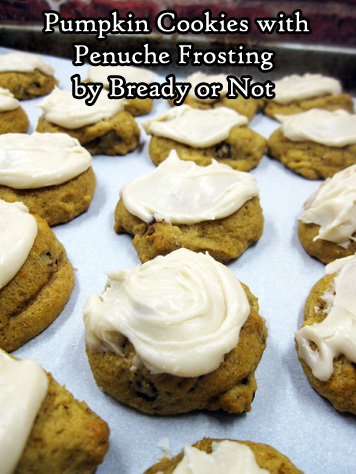 What is penuche, you ask? It’s a fudge-like candy made from brown sugar, butter, and milk. It has a very caramel-like vibe going on. 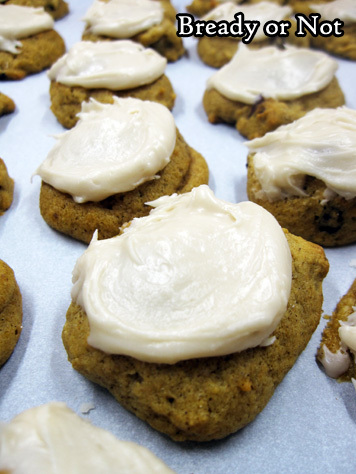 That makes it the perfect complement for these incredible cookies. The pumpkin-filled base is soft and cakey, with fragrant fall spices. These are really, really good. Pumpkin, spices, penuche. Oh yeah. 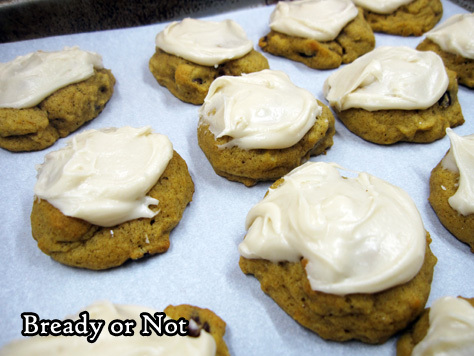 The recipe makes about 60 cookies if you use a teaspoon scoop, and they hold up best if eaten in one day. They get softer after that, but are still good. Recipe modified from Taste of Home magazine. 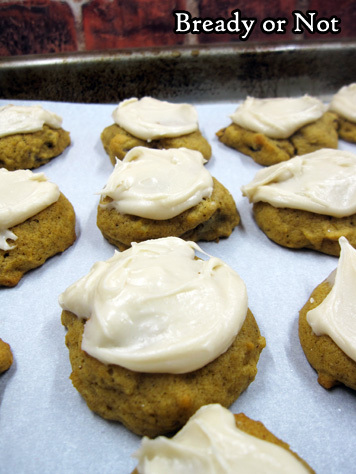 These super-soft cookies are full of pumpkin and spice flavor, with caramel-flavored frosting to add just the right amount of sweetness. Best eaten within one day. Preheat oven at 350-degrees. In a large bowl, cream butter and sugars together until they are light and fluffy. Beat in the egg, pumpkin, and vanilla. In a separate bowl, sift together the flour, baking powder, baking soda, cinnamon and salt. Gradually mix the dry ingredients into the wet. Fold in the pecans. Spread parchment paper on two large baking sheets. Drop dough by rounded teaspoon scoops spaced out to allow for a small amount of spreading. Bake for 9 to 11 minutes. Move cookies to wire racks to cool, which won't take long. Meanwhile, in a small saucepan, bring the brown sugar and butter to a boil. Keep on medium heat for 1 minute, continuing to stir, then remove from heat. Cool for 10 minutes. Transfer to a larger bowl and beat in the milk. Slowly add in enough confectioners' sugar to reach a spreadable consistency. Immediately frost cookies. Let set for an hour or so before packing up. Makes about 60 cookies. Best eaten within 1 day; they will still taste okay after that, but will soften more. Store cookies between wax paper layers in sealed containers.